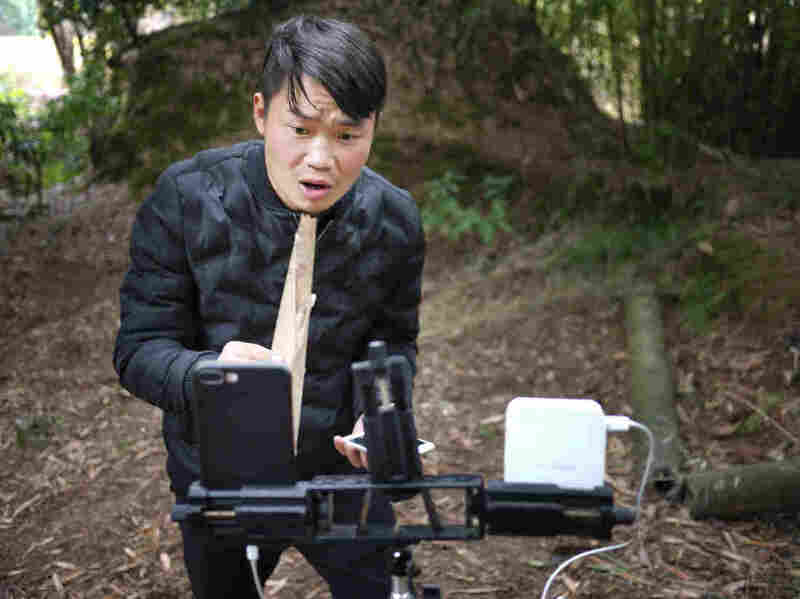 Livestreaming Country Life Is Turning Some Chinese Farmers Into Celebrities : Parallels Enterprising young farmers in remote, rural areas have become Internet celebrities by livestreaming mundane details of their lives to urban Chinese audiences. They're part of a $3 billion industry. Liu Jin Yin, a 26-year-old farmer, has thousands of viewers a day watching his livestream diaries of life on the farm. He has nearly 200,000 subscribers and earns about $1,500 a month. "This is called Dendrobium," he says, gazing into the camera while holding up the flowers. "It grows up here in the mountains of Sichuan province. It's expensive — hundreds of yuan for a kilogram — and it's good for your kidneys and it cures laryngitis." Liu's phone responds with rapid-fire messages of approval, rolling across a screen that explodes with tiny flower and beer icons, each of them worth several cents — donations from fans from all over China, watching him live. Of the 731 million people in China on the Internet, about half of them — a figure about the size of the population of the United States — are there to watch people like Liu livestream video of themselves. The content varies from pole dancing to online classes to advice sessions — all part of an industry worth $3 billion, according to Credit Suisse. 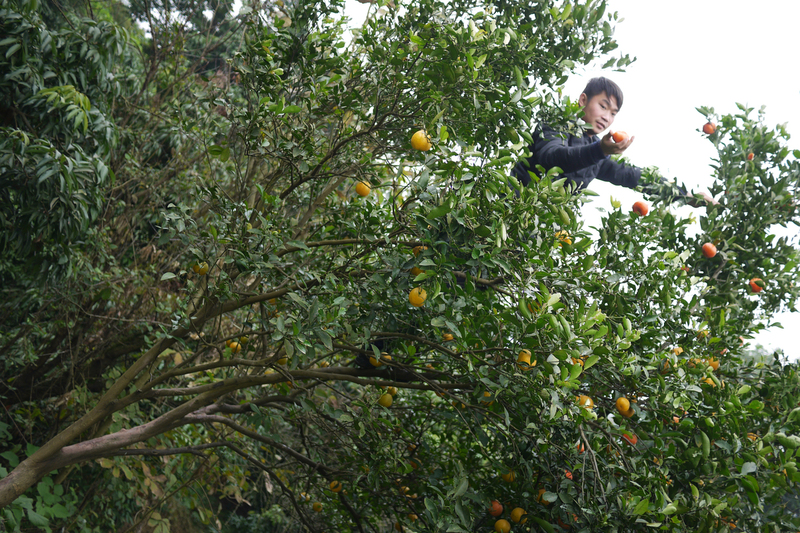 Liu Jin Yin films himself picking oranges at his farm in rural Sichuan province. 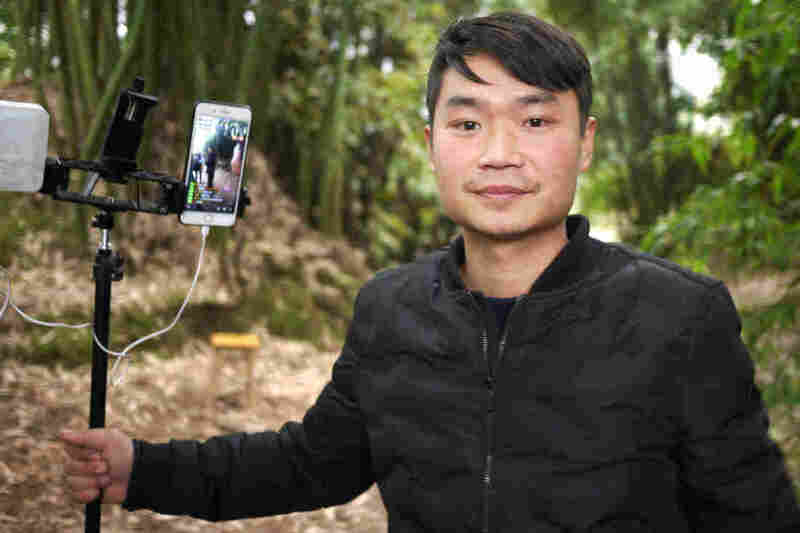 Each day, farmer Liu livestreams video of his life in rural Sichuan province to nearly 200,000 subscribers, who pay him the equivalent of $1,500 a month in virtual gifts — far more than anyone in his village has ever made. "When I was 16 years old, I traveled to the coast to work construction, then a zipper factory, and then I came home to breed goats, but that failed, too," Liu says. "Then I saw that it was possible to make money doing this." In the process, he has learned a few things, like how to read. Liu dropped out of his local rural school in the fifth grade and was semi-literate when he started this line of work. "I had trouble reading messages from my fans when I first started," he says with an embarrassed giggle, "but I've made progress. I'm also now able to stay at home to take care of my parents. Everyone's happy. This has changed me." Liu has even met his girlfriend, a clothing shop manager from the nearby metropolis of Chongqing, from his livestreams. She follows him along a narrow path between terraced rice paddies before they stop at an orange tree. "Brothers and sisters," Liu says into his phone while picking an orange, "here, have one, my treat! No, no pesticide on these! Thanks for your gifts!" More virtual gift icons spill across his phone screen, filling his account with more money. Liu typically begins his day livestreaming his morning chores — picking weeds, feeding pigs and cleaning up their pens. "When I started livestreaming, my neighbors saw me talking to myself and thought I had gone crazy," Liu says. "Some of them told my parents I was being tricked into a pyramid scheme. Everyone thought I had become a lunatic." But after the money started rolling in, says Liu, the skepticism vanished. Liu uses Huoshan, one of about 100 popular similar apps, to livestream his daily life. When his viewers buy virtual gifts to support him, the app company takes a percentage of his revenue. Top livestreamers in China are often young women broadcasting racy content, but China's authorities have banned apps for obscene content, leaving Internet celebrities like Liu who broadcast to a market of 344 million viewers. "It's very difficult to get entertaining entertainment in China," says Jeremy Goldkorn, the editor-in-chief of the China news site SupChina. "The movies that are shown in the theaters and the stuff that are permitted on the Internet are all highly censored, and as a result, highly predictable." And that's why revenue from livestreaming content in China has more than doubled in the past year, generating $3 billion per year. Farmer Liu Jin Yin croons into a makeshift microphone during a livestream for viewers from all over China. Liu says his online popularity is less about entertainment, though, than about nostalgia among China's fast-growing urban middle class. "A lot of people who live in urban China grew up in the countryside. They miss life on the farm and the fun they had when they were kids," he explains. "My most popular moments are when I livestream myself playing with an iron hoop or catching eels and crabs in the rice paddies." And as it turns out, the moment when I, a foreign journalist, arrive to interview him is popular, too. He livestreams our entire interview in a quiet bamboo grove down the hill from his farm. At one point, I turn to his phone and ask his viewers where they live. A list of cities rolls across the screen: "Chengdu, Hong Kong, Beijing, Shanghai, the United States..."
A couple of viewers request that Liu and I sing an English song together. Sensing a business opportunity, Liu fires up a karaoke app on another phone and bullies me into singing a Chinese karaoke classic. As I've done for years in China, I reluctantly comply, and suddenly, it's "Yesterday Once More." "Every sha-la-la-la-la, every woah-oh-oh, still shines," we sing together, the familiar Carpenters song playing in the background while Liu uses a tree branch as a mock microphone. Beer, flowers and other symbols of virtual gifts from fans fill Liu's phone screen. By the end, he has made $50.